Five years have passed since Artificial Intelligence last gave the world an album. The world of drum & bass has changed vastly since then, but they continue to plough their timeless path uncompromisingly. 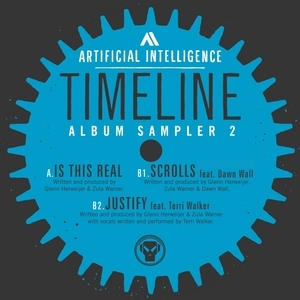 Like the first sampler, this EP features some very well selected guests (Terri Walker who has worked extensively with Spectrasoul and Swindle and the anonymous Dawn Wall) but the real stars are Zulu and Glenn. "Is This Real" is a purring double bass glider a la Full Cycle, "Scrolls" is a majestic diva-peppered dreamer (think early High Contrast or Logistics) "Justify" is a big old soul shock-out that's up there with their modern-classic "You Can Dream". Album hype doesn't get more beautiful than this.